Would you allow your children to eat mud? 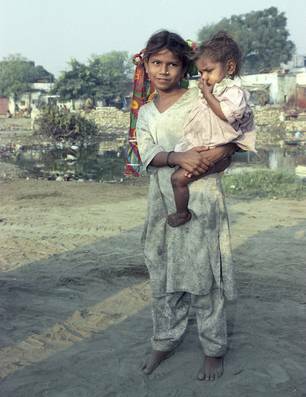 The World Bank estimates that one third of all the very poorest people in the world live in India. Though with a booming information technology industry, the number of children that are severely malnourished has not improved. Along with malnutrition come frequent diarrhea, malaise, and dehydration. For the poorest of the poor quality medical care is non-existent. Some 3,000 children die daily due to illnesses related to poor diets. 42% of children under the age of five are underweight, according to a recent government survey. They are not just statistics but real children who are precious in God’s eyes. J and I decided to sponsor two little girls last year after reading “Revolution in World Mission“. After which I volunteered to blog for GFA to share about the plight of the Dalits who are considered less than human under the Hindu caste system. (I have to confess that I am not very faithful in writing but I will do better to write monthly). The more I read and research about them, the more I feel for them. I hope you will take time to find out more about them and make a difference to their lives. I’m delighted to hear from my husband that a friend of ours is also sponsoring a child through Gospel of Asia. You can make a difference to the ONE you sponsor too. Would you be their bridge of Hope? Nice work Dee. I love this act of love 🙂 keep it up!